Have you ever heard of disposable emails? We have already covered NoteDIP to send self destructing emails and messages. Disposable email services work in similar way. You can use these services to send emails that will expire after specified time. Disposable email service provider allows users to create a temporary email address which will only for specified time. After that time, email address will no longer exists. Why you need Disposable Email addresses? This is the first question comes in mind when we talk about disposable email addresses. Most of the people think that it is used for prank and crimes. It is not true. Disposable emails are useful when you want to use a service for one time and do not want that service to use your email address to send newsletters. If you want to register on a website just for testing purpose, you can use these service to protect your original work email address. In this way, you can save your inbox from spam and newsletter emails. In this post, we will see few websites that allow users to create disposable email addresses for limited amount of time. After expiration, email address will no longer exists. 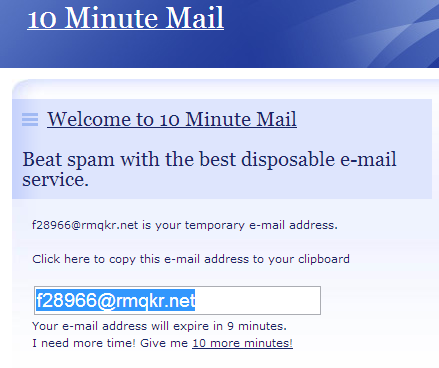 10minutemail is a nice online service that allow users to create a temporary email address. By default it creates email address only for 10 minutes. But you can increase this time if you need. When you visit the website, it will give a random disposable email address. Just scroll down the page and you will see your inbox there. All messages sent to this disposable email address will be listed there. And you will be able to access your emails. Most important thing is that the service does not ask for registration. Fakemailgenerator works similar to 10minutemail except the expiration time of email address. 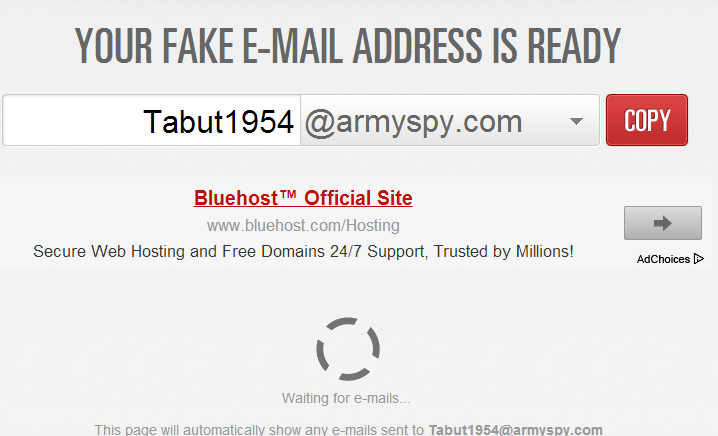 When you visit the Fakemailgenerator, it generates a email address that is valid only for 24 hours. In case you want to create a custom email address, you can create one. All the emails sent to this emails will be shown at the bottom of the page. 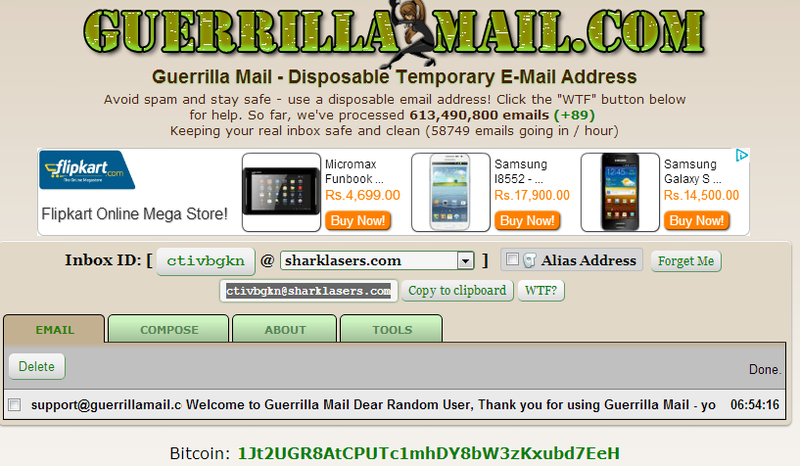 Guerrillamail is another popular disposable email service provider. The service is online for more than 7 years. It lets users have a temporary email address for 60 minutes. It is similar to the other services. On visiting website, you will be assigned a random email address. At the bottom , it shows send and received emails. Jetable is another service that gives you free temporary email address and lets you choose the life span of this email address. After the lifespan, this email address will be deactivated. 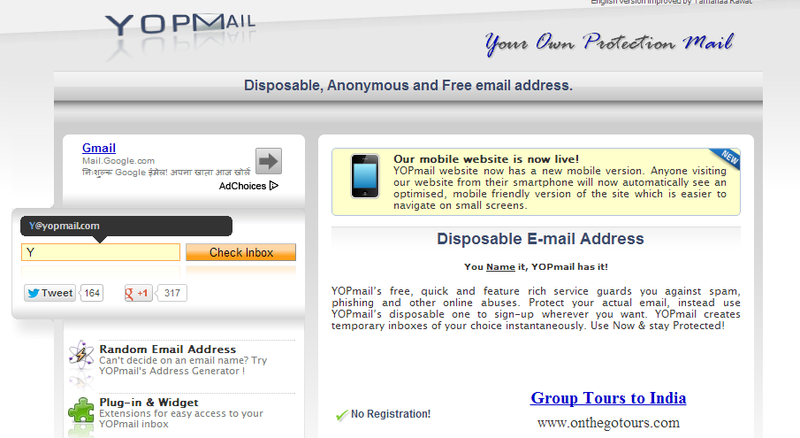 YopMail is another nice service that lets users create disposable, anonymous and free email address. If is quick service and you do not need to register or signup. Everything is free of cost. It is also available as Firefox extension. So you can access your emails quickly. There are many other this kind of services available. We will list more in upcoming posts. 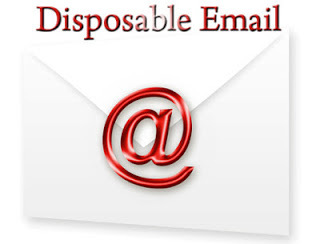 Till then try these disposable email service providers and share your experience with us.